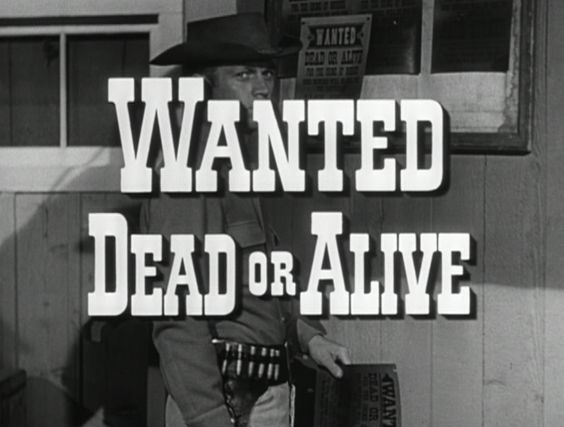 Wanted: Dead or Alive is an outstanding (though little-known) western TV show that ran during what many refer to as the ‘golden age of television’. Westerns were hugely popular with TV audiences in the 50’s and 60’s and Wanted: Dead or Alive slipped through the cracks for whatever reason, running for only three seasons. It might have been entirely forgotten, had not the show’s star, Steve McQueen, gone on to bigger and better things. Anyway, today I want to discuss one of Wanted: Dead or Alive’s most powerful episodes, in my mind – ‘Secret Ballot’. The episode begins with Josh riding down the street of a small town. There’s a large banner strung across the street that says NED EASTER FOR MAYOR. That doesn’t make The Bad Guys happy, the ones who just a moment before were gloating about the much smaller poster that advertises their favorite candidate, Barney Pax, the current (and corrupt) mayor. One of the bad guys is Steve Pax, by the way, Barney’s brother, and you can imagine what the town’s like if the mayor and the sheriff are not only corrupt, but brothers as well. Anyway, one of Steve’s lackeys goes over, swings a rope over the banner, and yanks it down. Josh takes exception to this and suggests that the guy put it back up. That doesn’t go over well with Steve or his two deputies, of course (I dunno if the two guys hanging around with Steve are actually his deputies, but I’m just going to guess that they are) and they ‘suggest’ that Josh should move on. (Surprisingly, he does.) And then there’s this great little exchange that always cracks me up. After Ned leaves, Josh and Carol discuss some things, like how Ned’s the first person to stand up to Barney Pax, how Ned deserves to win the election more than anyone else, and how Barney made Steve sheriff to keep all his dirty dealings and murderous tricks legal. There seems to be no way of stopping Barney, especially because he tends to scare people out of voting for anyone other than him. But then Josh pulls out a wanted (dead or alive, naturally) poster for Steve Pax, alias Steve Patrick. According to Carol, the poster could win the election for Ned, I guess because it would discredit Steve and so people would be less afraid of Barney’s threats. Dolly gets pretty angry, but even more so when Josh shows her the reward poster for Steve Pax. Then he gets Ned to read it out loud and everyone drifts away from Dolly and her dancing girls, so I suppose it made a pretty big impression. Later on, at the schoolhouse, Ned tries to get Josh to change his mind and leave Crater City instead of sticking around and maybe getting himself killed. That’s when you learn Important Backstory Information ’cause Josh mentions that Ned (‘Corporal Ned Easter’) went out of his way to help him a couple times (during the Civil War, I’m assuming). And that just makes what happens at the end of this episode even more heartbreaking and just…ugggggh. But I’m getting ahead of myself. Dolly shows up at the schoolhouse with a message for Josh: Barney Pax wants to see him. Josh follows her into a room at the back of the saloon, where she leaves him to wait, saying she’ll go get Barney. While Josh waits, he either hears a noise coming from a closet in the room or just assumes that someone might be hiding in there, and when he opens the closet door, out tumbles Steve Pax. Dead. There’s a bullet hole in his back and, of course, Barney and and a couple of his/Steve’s friends come in right then and find Josh standing over Steve’s body. Barney takes his (Josh’s) gun. Commercial break. I’d like to point out right here that Steve Pax is played by DeForest Kelley and I promised my dear friend Maribeth a screenshot just of him since she’s a huge Trekkie (and I’m a second-hand one because of her), so here it is. By the way, Barney was the one who killed Steve, or at least ordered the killing. I don’t think it’s ever proven or said outright, but you just know. Let me just say that whoever cast this episode did a great job because the actors and actresses all perfectly inhabit their roles, making Ned upright and honest, Barney seemingly upright and honest but with a certain untrustworthiness, Steve a creep (sorry, DeForest Kelley fans! ), Carol conniving, and Dolly cheap. It’s very interesting, watching them all play off each other. Anyway, Barney comes over and takes the written agreement from Ned. When he leaves, Ned asks Carol if what she said about Josh was true (as opposed to something she just said to make turn him against Josh so that he wouldn’t give up the election). And she says “Oh, what difference does it make now?”. PLENTY of difference. A years-old friendship is at stake! UGH. Ned goes off to find Josh after that little exchange (I don’t know if he still believes Carol’s lies or not right here) and once he’s gone, Carol grabs a gun and goes off to the saloon to see Barney. Meanwhile, Josh has slipped back into the saloon’s back room and listens in on Carol and Barney’s exchange. She threatens him with her gun so that she can get Ned’s agreement back. Barney says that it’s already at the printers, but that’s a lie, as Carol points out – he hasn’t had enough time. Things happen really fast after that. Josh opens the door he’s hiding behind and Carol turns and tries to shoot him. Josh slams the door shut and then Barney fires three shots at said door. Then Barney cautiously enters the room, Josh emerges from the closet with his shotgun ready, Barney turns from the window to Josh, and Josh shoots him. Obviously, Barney dies and that’s the end of him. Dolly seems quite upset about it, though…but enough about those two. Josh gives Ned’s paper back to Carol. In all fairness to Carol, I think it was more of a reflex thing, her shooting at Josh, based on their little exchange right after she gets the paper back. And thennnn there’s The Awful Tag Scene. Hate it, hate it, hate it. Basically, Carol comes running down the boardwalk after Josh and tells him about some of the lies she told Ned and she’s all ashamed and upset and kind of puts her head on his shoulder and then Ned walks up and asks Josh if what Carol said was true and Josh says “Yeah, she told you the truth” and then Ned gives him a look and he walks away and it’s horrible, it really is, because of (among other things) the expression on Josh’s face as he leaves. Plus, he and Ned were such good friends. The ending of this episode is powerful and unexpected and completely unfair, but that’s sometimes life, y’know? Have you seen this episode of Wanted: Dead or Alive? What do you think of it? Wait–wait–that picture of Steve Pax looks awfully familiar . . . Oh, I see now, it’s McCoy. I knew it was either him or Scotty, haha. Yep– that episode was “The Empty Cell,” a second-season episode the OAD being 10/17/59 on CBS. I think the reason we call that era the Golden Age of Television is because of all the wonderful westerns. It is particularly amazing how much story can be crammed into the 30 minute format. If you haven’t yet seen it, try to find the 1956-1958 series Broken Arrow. It starred John Lupton. I looked up that series and it does look interesting. Maybe I’ll pick up some episodes at some point. It’s crazy, how much story can be crammed into less than half an hour of television – sometimes more than several episodes of some more modern TV shows. I adore how much story this show could pack into a 30-minute timeslot. It is staggering sometimes! This ep is an excellent example of that. Nice write-up! Also, I’m snurching that last pic of Josh. Yep, it’s pretty amazing, and you really get a sense for all the story they managed to tell when you break down the episode like this. I can’t believe I haven’t seen this show before, it’s sounds like just my dad’s cup of tea. It’s an old Western show and it has Steve McQueen! Wanted: Dead or Alive is one of my favourite TV Westerns, particularly because it was so different. Josh Randall (played by the King of Cool, Steve McQueen) was not a lawman. He was not a drifter. He was a bounty hunter. That gave them a flexibility other Westerns did not always have. This is one of my favourite episodes, in large part because I love seeing DeForest Kelley play a bad guy. Like many DeForest Kelley fans (perhaps most my age), I first encountered him as Bones McCoy on Star Trek. It is so fun watching him in the old Westerns playing characters who would do things that Bones would never do! Thank you so much for taking part in the blogathon and writing about one of my favourite shows! Yes, it’s definitely a different kind of western and I love it. Gah, so sorry it’s taken me this long to comment! My weekend got busy 😛 This was a really enjoyable and educational blog post, since my exposure to old-time Westerns is pretty much limited to “The Big Valley” (which is fantastic) and “Bonanza.” I’ve never seen “Wanted: Dead or Alive,” although I HAVE heard many good things about Steve McQueen. Also: MCCOY HOW *COULD* YOU?! Gone to the Dark Side…tsk-tsk-tsk 😉 Although to be honest, it’s not too hard to imagine him as a Western villain; McCoy has a certain all-American abrasiveness that would serve him well in such a role. There’s a Star Trek episode where he, Kirk, Spock, Scotty, and Chekov find themselves trapped at the OK Corral. It’s an odd episode (third season, so that explains it, haha) but it’s kind of funny since all of those actors (except maybe the guy who does Chekov) had been in Westerns at some point or another. Oh, that’s fine. I totally understand about busy weekends and such. 🙂 You know, I’ve seen a few Big Valley episodes and, overall, they never really gripped me. I do quite enjoy Bonanza, though. Hehe. It was fun, reading your comments on Kelley/McCoy. 🙂 How do they manage to find themselves in places like the OK Corral and Nazi Germany, btw? Well, they’re not REALLY at the OK Corral or Nazi Germany. As far as the Corral goes, it was a test by an alien race to see if they would act like their ancestors did in the 1800’s. In the other instance, a historian from Earth came to that particular planet and imposed a Nazi-like culture on it. But there ARE a few time travel episodes; at one point they get stuck in the Great Depression, two episodes have them in the Space Age, and a movie has them in the 1980’s (which is HILARIOUS). I don’t have anything to say about this episode. Has anyone ever noticed that Josh Randall sometimes wore a late 50’s early 60’s era welders jacket with modern snaps?